Brazil's far-right President-elect Jair Bolsonaro says he wants the country's best-known anti-corruption judge to be justice minister or to serve on the Supreme Court. Sergio Moro has been the driving force behind an anti-corruption probe known as Operation Car Wash. In his first TV interview since being elected, Mr Bolsonaro also underlined his campaign pledge to loosen gun laws. The former army captain won a sweeping election victory on Sunday. 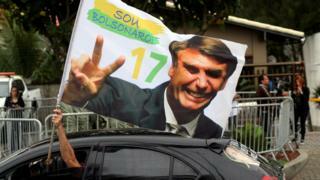 Can Bolsonaro ride the 'Bullsonaro wave'? Jair Bolsonaro: The Trump of the Tropics? However, his praise of Brazil's former dictatorship and his comments on race, women and homosexuality have raised concern. 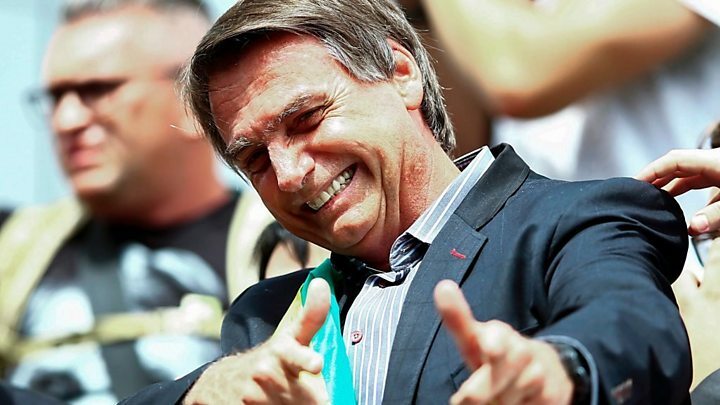 Mr Bolsonaro's populist approach has led to some media dubbing him "Trump of the Tropics". What has Mr Bolsonaro said? The 63-year-old former paratrooper chose to give his first post-election interview to Record TV, a network owned by one of Brazil's biggest evangelical leaders. Mr Bolsonaro relied on the support of evangelical groups in the run-up to the election. He said he intended to speak to Judge Sergio Moro "soon" and invite him to the justice ministry or to the Supreme Court. He said Mr Moro would be a person "of extreme importance in a government like ours". Mr Bolsonaro also said he would seek to loosen Brazil's gun laws this year, before he even takes office, insisting that more widespread gun ownership would help to cut crime. Relaxing gun laws was one of his flagship policies and he has suggested that "every honest citizen" should be able to own a gun. 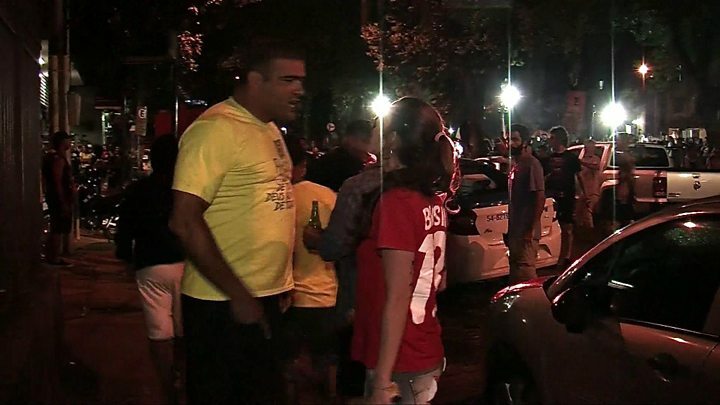 Critics warn that such a move would only worsen violent crime in Brazil. He would withdraw government advertising from media outlets he judged to be "lying"
The federal judge has been in charge of a major investigation into claims that executives at the state oil company Petrobras accepted bribes in return for awarding contracts to construction firms. Operation Car Wash uncovered a huge web of corruption involving top-level politicians from a broad spectrum of parties. However, the judge has also been criticised by many, especially those in the left-wing Workers' Party after jailing former President Luiz Inácio Lula da Silva on corruption charges. They say the former president has been the victim of a political witch-hunt. What is Mr Bolsonaro likely to do in office? Mr Bolsonaro is a deeply polarising figure whose controversial comments have caused supporters and opponents alike to take to the streets. In one infamous incident in 2015 he told a fellow lawmaker she was too ugly to be raped. Mr Bolsonaro leads the Social Liberal Party (PSL), an anti-establishment group that combines social conservatism and pro-market policies. In the past he has defended the killing of opponents to the country's former military regime and said he is "in favour of dictatorship". However, as the election result became clear on Sunday night, he told supporters he would be a "defender of democracy" and uphold the constitution. He has also promised to reduce state intervention in the economy and indicated that Brazil could pull out of the 2015 Paris Agreement on climate change. He will take office on 1 January 2019. It remains unclear of Mr Bolsonaro will be able to see all his policies get through Congress. The PSL party achieved a breakthrough in this month's legislative election, increasing its representation from one to 52 seats in the lower house. But the Workers' Party, led by Mr Bolsonaro's election rival Fernando Haddad, remains the largest party with 56 seats. There will also be a record 30 parties represented in the next Congress. This suggests that finding backing for legislation could be difficult for the new president. How did the result break down? Sorry, your browser cannot display this content.